Since taking office, President Barack Obama and his administration have taken unprecedented action to address the threat of climate change. Through policies to improve energy efficiency, increase vehicle emissions standards, encourage renewable energy production, and reduce pollution from coal-fired power plants, the administration has made remarkable progress toward meeting the president’s new goal of reducing emissions of greenhouse gases, or GHGs, by 26 percent below 2005 levels by 2020, as part of an agreement with China. However, even with these remarkable actions, there is still a blind spot in U.S. efforts to address climate change. Today, taxpayer-owned gas, oil, and coal extracted from federal lands and waters by private companies are one of the nation’s most significant sources of GHG emissions, accounting for more than one-fifth of all U.S. GHG emissions. The U.S. Department of the Interior, or DOI, which has jurisdiction over the nation’s public lands, has no comprehensive plan to measure, monitor, and reduce the total volume of GHG emissions that result from the leasing and development of federal energy resources. Federal lands and waters could have accounted for 24 percent of all energy-related GHG emissions in the United States in 2012. Combustion of coal from federal lands accounts for more than 57 percent of all emissions from fossil-fuel production on federal lands. Methane pollution from venting and flaring from onshore federal leases rose more than 51 percent onshore between 2008 and 2013, according to government data. In addition to summarizing the new estimates provided by Stratus Consulting, this issue brief recommends a comprehensive plan to address the blind spot in the administration’s plan to fight global climate change. The DOI has yet to develop a plan to accurately account for, manage, and mitigate the GHG pollution that results from the extraction and combustion of fossil fuels from public lands and waters. In 2010, the White House Council on Environmental Quality, or CEQ, released its “Federal Greenhouse Gas Accounting and Reporting Guidance,” which was subsequently updated in 2012. This document laid out the greenhouse gas footprint for the federal government, but it explicitly left out emissions associated with or resulting from the use of public lands and waters by private entities. The guidance gave land-management agencies the option to report “activities associated with land management agencies,” including emissions from “third-party oil, gas, and coal mine leasing activities.” However, in CEQ’s “Federal Government Greenhouse Gas Inventory by Agency for fiscal year 2010,” the DOI only reported that its largest sources of GHG emissions were from purchased electricity, federal employee commuting, and its passenger vehicle fleet. It seems as if the Obama administration has started to recognize this gaping hole in their emissions accounting and reporting structure. In December 2014, CEQ issued new “Revised Draft Guidance for Greenhouse Gas Emissions and Climate Change Impacts,” calling for federal agencies to consider the impacts of GHG emissions and climate change in environmental reviews and impact statements under the National Environmental Policy Act, or NEPA, and to specifically include emissions associated with private activities on public lands and waters. While this new draft guidance is an important step in the right direction to account for emissions from public lands, it does not directly address existing leases on federal lands and will not result in a full picture of the carbon emissions resulting from energy resources extracted from the nation’s public lands and waters. 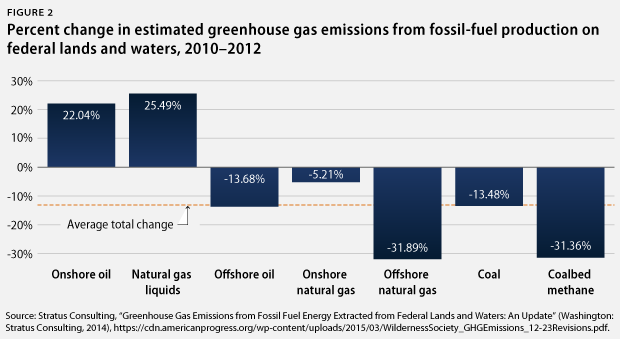 Independent estimates of GHG emissions from fossil fuels extracted from federal lands and waters suggest that these energy resources contribute a large share of overall U.S. GHG emissions. According to Stratus Consulting’s new estimates, these energy resources could have accounted for more than 1,340 million metric tons of carbon dioxide equivalent, or MMTCO2e, in 2012; an amount equal to annual emissions from more than 280 million cars on the road. Ultimate emissions of carbon dioxide, methane, and nitrous oxide from the combustion of these fossil fuels could have accounted for almost 21 percent of all U.S. GHG emissions or 24 percent of all energy-related U.S. GHG emissions. As shown in Figure 1, more than three-quarters of these estimated emissions, or a total of more than 1,028 MMTCO2e, are associated with onshore energy resources. Estimated emissions from fossil fuels extracted on public lands and waters have decreased slightly over the past few years likely due to a change in the mix of energy produced from federal lands. 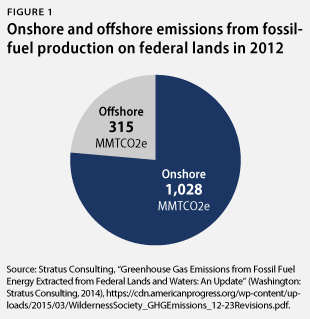 A prior study by Stratus Consulting found that fossil fuels extracted on public lands in 2010 could have accounted for 1,154 MMTCO2e of U.S. emissions—126 MMTCO2e more than in 2012. Market forces have reduced demand for coal and increased demand for natural gas and oil, and technological advancements have further made these resources more economical to develop. These changes in production on public lands and waters would therefore result in a significant reduction in estimated emissions because natural gas has a substantially smaller carbon footprint than coal when combusted—not accounting for fugitive emissions, meaning unintentional leakage during production. Also, the administration has prioritized investments in expanding renewable energy technologies and expediting the pace at which utility-scale solar and other renewable energy projects are developed on federal lands. Public lands provide many benefits in a changing climate, including connectivity for wildlife migration and the potential for absorbing carbon released. However, estimated GHGs emitted from public lands energy resources dwarf these benefits and outweigh the amount of carbon that can be absorbed by public lands. According to an earlier analysis by CAP, public lands in the lower 48 states in 2010 were contributing nearly 4.5 times more carbon to the atmosphere than these lands were able to absorb. Even as estimated emissions from fossil fuels extracted on public lands have seen moderate decreases, it appears emissions from onshore oil and natural gas liquids have increased by more than 20 percent. Specifically, estimated emissions of onshore oil increased 22 percent from 2010 to 2012, and estimated emissions from onshore natural gas liquids increased more than 25 percent during this period. Despite the slight overall decreases in production—and therefore emissions—in recent years, estimated emissions from the use of federal coal is still one of the largest sources of potential GHGs from federal lands. As depicted in Figure 3, in 2012, coal from federal lands was the source of more than half of all estimated emissions from fossil-fuel production on federal lands—totaling 57 percent. Coal from federal lands was responsible for an estimated 769 MMTCO2e of emissions in 2012, which is the equivalent of annual emissions from more than 161 million cars on the road. 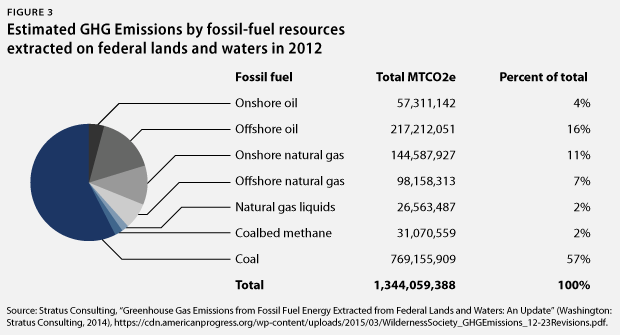 Figure 3 shows the 2012 estimated GHG emissions and the total emissions of MMTCO2e by type of fossil fuel extracted. While accounting for more than half of all estimated emissions, coal production on federal lands occurs in a few key western states. In 2012, coal production in Wyoming, Colorado, and Montana contributed 93 percent of all estimated emissions related to coal produced from federal lands. 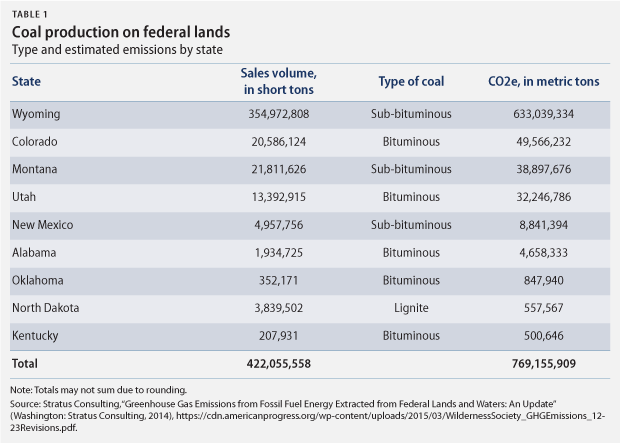 Table 1 provides an overview of the estimated emissions from coal extracted on federal lands by state. A significant portion of these estimated emissions can be attributed to coal production in the Powder River Basin, which stretches across southeast Montana and northeast Wyoming. In fact, emissions from coal extracted from public lands in Wyoming and Montana alone notably contribute almost 50 percent of total GHG emissions from fossil fuels on federal lands and waters—and more than 65 percent of total emissions from onshore fossil fuels. The Powder River Basin produces more coal than anywhere else in the country, providing 40 percent of all U.S. coal to more than 200 power plants in 35 states. 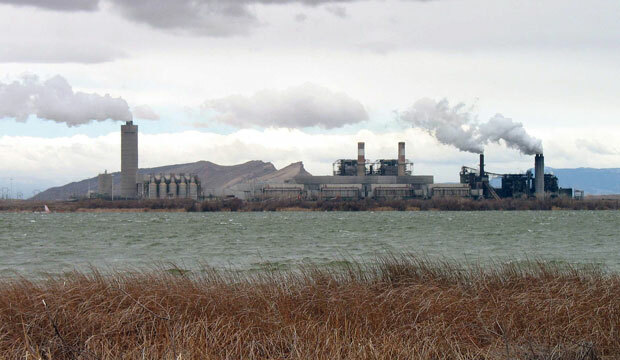 Coal from federal lands in Wyoming and Montana, including the Powder River Basin, contributed more than 13 percent of all GHG emissions from fossil fuels in the United States and more than 10 percent of all U.S. GHG emissions. A July 2014 CAP report also found that there are serious economic and social costs of burning Powder River Basin coal that policymakers have generally overlooked. Methane emissions are particularly concerning because methane is a much more powerful GHG: Over a 100-year period, the effect of methane is 34 times greater per metric ton than that of carbon dioxide and even greater in the near term. According to the EPA, 29 percent of all U.S. methane emissions come from natural gas and petroleum systems, and 10 percent come from coal mining in the United States. In October 2014, CAP and TWS both released reports analyzing the emissions of methane from different phases of the production and processing of fossil fuels on public lands and waters. Both reports explored the significant uptick in industry-reported data disclosing emissions from venting and flaring of natural gas over a five-year period, from 2008 to 2012, and also discussed recent literature showing even higher levels of methane released from fugitive emissions, or the unintentional leakage of methane during production, transportation and distribution activities. The Bureau of Land Management, or BLM, is currently in the process of proposing regulations to curtail the waste of natural gas resources through venting and flaring activities on public lands. A groundbreaking, independent technical analysis estimated that up to 50 percent of wasted methane can be captured cost effectively. Taxpayers deserve a strong rule that updates venting and flaring practices to ensure these preventable emissions are reduced. The BLM should also look to curb fugitive emissions from production and delivery systems through better and more accurate monitoring, accounting, and curtailment. Policymakers should be concerned about the practices of venting—directly releasing natural gas into the atmosphere, which primarily emits methane—and flaring—burning natural gas to release into the atmosphere, which primarily emits carbon dioxide. These practices waste natural gas that could be captured for consumption or sale and add significant levels of GHGs to the atmosphere. In 2010, the Government Accountability Office, or GAO, found that more than 40 percent of vented and flared natural gas could be “economically captured” with currently available technology. Oil and gas companies operating on federal lands and waters are required to report volumes of natural gas vented and flared to DOI’s Office of Natural Resources Revenue, or ONRR. A variety of factors, including the continued use of out-of-date monitoring systems, make accurate accounting of venting and flaring volumes a significant challenge. ONRR collects the only industry-reported data available, although an independent audit found that these data likely underestimate total volumes because they do not include all sources of emissions. Nevertheless, based on these industry data collected through the Oil and Gas Operations Reports, or OGOR, estimated methane emissions from reported venting and flaring on public lands and waters have more than doubled between 2008 and 2013. Following the October 2014 reports, CAP and TWS asked Stratus Consulting to provide additional analysis of the industry data in the OGOR reports and to compare trends in estimated emissions from reported venting and flaring volumes onshore with venting and flaring volumes offshore. 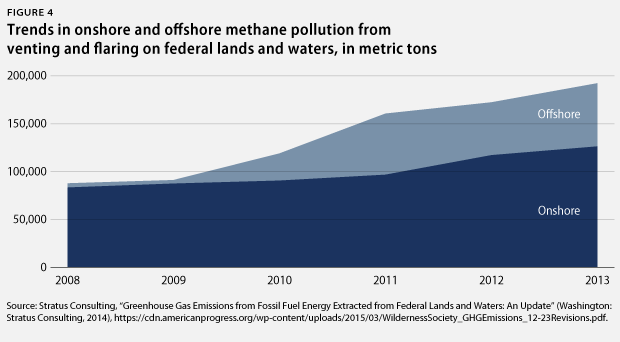 Figure 4 shows the trends in onshore and offshore levels of estimated methane pollution from reported levels of venting and flaring. This new breakout of onshore and offshore methane emission estimates, based on industry-reported data, provides additional insights that are relevant to policymakers. Of particular note, estimated emissions based on reported volumes from offshore areas jumped dramatically between 2009 and 2011. This increase coincides in time with the implementation of a 2010 DOI rule requiring that offshore oil and gas operators install meters to record volumes of gas released through venting and flaring, and an additional requirement that operators submit OGOR data parsed out by volumes of gas vented or flared. These data suggest that metering results in higher and presumably more accurate reporting of vented and flared gas. It is also worth noting that, even with meters in place, methane pollution from venting and flaring from offshore operators rose an estimated 19 percent between 2012 and 2013. Unlike the Bureau of Safety and Environmental Enforcement, however, the BLM does not require all producers to install meters to monitor the volume of gas that is vented or flared and to ensure the accuracy of reporting to government regulators. But presuming that companies are complying with federal laws and regulations that require them to provide accurate information to the BLM, then it is estimated that methane pollution from venting and flaring on federal onshore leases increased 51 percent between 2008 and 2013. This increase appears to be consistent with a recent EPA report that states venting and flaring of associated gas across federal, state, and private lands has risen in recent years. Because the BLM does not currently require meters, which would aid in independently verifying third-party data, there are still large uncertainties related to the total volume of gas that is being wasted through venting and flaring. Still, it is clear that the volume of wasted gas is high and that the resulting methane pollution is a major problem that is rightly being addressed as part of the Obama administration’s “Strategy to Reduce Methane Emissions.” As part of this larger strategy, the BLM is currently developing a rule to reduce methane emissions from the venting and flaring of oil and natural gas on public lands. The rule is a critical piece of the larger climate change puzzle; it is a needed step to better account for and reduce overall methane and GHG emissions from federal lands and waters. Although wasted gas from venting and flaring practices continues to contribute to GHG pollution, fugitive emissions from the production, processing, and distribution of fossil fuels from public lands remain a much more significant source of methane. As noted by CAP and TWS in previously issued reports, methane pollution released from fugitive emissions at the well site, or upstream; during processing, or midstream; and in storage, transmission, and distribution processes, or downstream, is significantly higher than the overall amount of methane released from venting and flaring of natural gas and oil. The amount is at least 3.5 times more than methane emitted from the combustion of extracted fossil fuels from public lands. The lack of a consistent and accurate process for measuring or reporting fugitive emissions has resulted in great uncertainty in accounting for these emissions. In fact, the extreme range of estimated fugitive emissions—200,000 metric tons to more than 8 million metric tons of methane—illustrates this uncertainty. Nevertheless, even the lowest estimates of methane from fugitive emissions are well above the highest estimates of methane pollution from other sources related to fossil-fuel extraction, emphasizing that fugitive emissions are a real problem. It is critical that the Obama administration take action to address this significant source of methane pollution. In its Priority Agenda for Enhancing the Climate Resilience of America’s Natural Resources, released in October 2014, the administration took a noteworthy step forward in recognizing the critical importance of America’s lands and waters in climate policy. The priority agenda is aimed at making “the Nation’s natural resources more resilient to a changing climate” and outlines actions to “foster climate-resilient lands and waters.” Of particular note, the agenda prioritizes measuring and enhancing the ability of land and waters to absorb carbon dioxide and directs the U.S. Department of Agriculture, or USDA, along with the EPA, the State Department, and the DOI to “establish a robust capacity to provide projections of greenhouse gas emissions and carbon sequestration from agricultural lands, forests, and grasslands on a biennial basis.” However, the priority agenda fails to mention the need for better accounting and future estimation of GHG emissions from the development of energy resources on public lands. The goals set out in the administration’s priority agenda are a needed step for the country to begin to rein in runaway emissions. While it is clear that the United States is making progress in reducing GHG emissions and beginning to recognize the importance of natural resources in addressing climate change, total levels of emissions resulting from fossil-fuel production on America’s lands and waters remain uncertain at best. Thus, it is critical that the administration act to account for and reduce these emissions. A comprehensive method of mandatory accounting for carbon and methane emissions from proposed resource extraction projects on public lands is necessary to understand the full scope of the problem the nation faces. The administration should finalize the “Revised Draft Guidance for Greenhouse Gas Emissions and Climate Change Impacts” that requires project reviews to recognize the climate footprint of projects on public lands and to fully account for the impacts that occur from developing these resources. Additionally, the administration should take steps to develop and maintain an inventory of the carbon committed to extraction through leases and other means. Setting royalty rates for fossil fuels to account for the full costs of carbon pollution and externalities in order to ensure taxpayers receive a fair return. Curtailing fugitive emissions from oil and gas operations on public lands as part of the BLM’s venting and flaring rule, by requiring companies to pay for the right to vent and flare. Requiring onshore operators to install vent and flare meters to adequately account for volumes of vented and flared gas to ONRR. Requiring oil and gas operators to install best-available technology to reduce the practice of venting and flaring. Requiring industry to measure fugitive methane emissions from upstream, midstream, and downstream production activities. Implementing President Obama’s plan to reduce methane by at least 45 percent by 2025 in part by requiring the aforementioned measures on the part of operators to reduce methane emissions from venting, flaring, and fugitive emissions. These actions would provide taxpayers a fair return on their resources that are now senselessly wasted and would also reduce emissions of climate-change-inducing-pollutants into the atmosphere. Actions the Obama administration is currently taking, including implementing the priority agenda, promulgating a venting and flaring rule for natural gas production, and exploring measures to address fugitive emissions are steps in the right direction. Nonetheless, fossil fuels extracted on public lands and waters continue to result in significant amounts of GHG emissions at all stages of production. In order to ensure the success of the administration’s Climate Action Plan, it is critical that the administration account for and address these emissions and work to restore balance to America’s public lands and waters. Claire Moser is a Research and Advocacy Associate with the Public Lands Project at the Center for American Progress. Joshua Mantell is a government relations representative at The Wilderness Society. Nidhi Thakar is the Deputy Director of the Public Lands Project at the Center. Chase Huntley is the senior government relations director at The Wilderness Society. Matt Lee-Ashley is a Senior Fellow and Director of the Public Lands Project at the Center.